Donate here to keep us going! 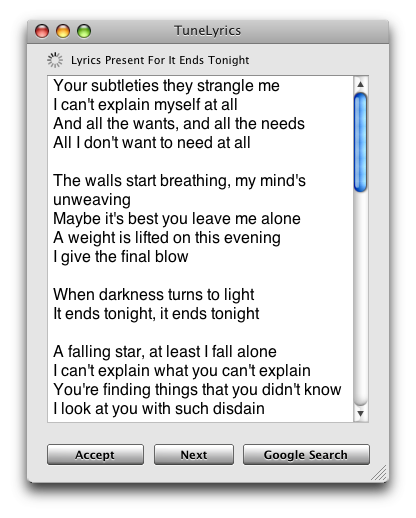 LyricsMenu - The most gorgeous and powerful lyrics-fetching freeware you will ever need with iTunes. Powerful: LyricsMenu give you the best choice and control over your song lyrics. What is the best lyrics for your song? You decide. Gorgeous: If there's something obvious in LyricsMenu, it has got to be the interface. Awesome HUD interface with a great album artwork which goes easy on the eyes. Small: We hate making bloated applications. That's why every byte added must be worthwhile. And LyricsMenu is one neat application at only under 1 MB. Non-Intrusive: LyricsMenu does not bother you. It springs up when you need it and disappear when you are done with it. Stable And Bug-Free: We hate making things that are spoilt. That's why we make sure every releases are tested thoroughly. Support-Ready: Like TuneLyrics, we value the users and to us, every feedback counts. Free: We make this with the intent of sharing the joy of lyrics with the world. That's why we are making this free. All we ask of is a kind word of thanks or a quick feedback. And if you can, spread the word around to others! 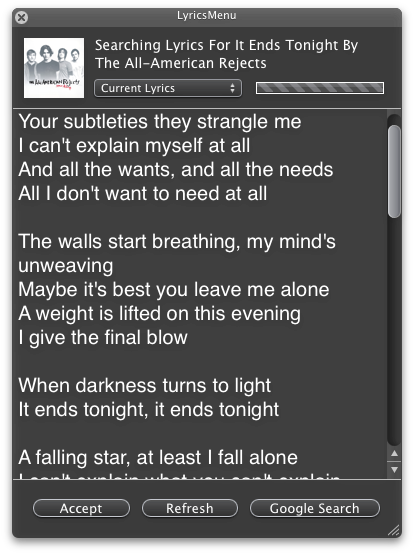 TuneLyrics - A lyrics-fetching and high-quality album artwork finder freeware and is a perfect companion with iTunes. KISS: We make TuneLyrics simple -- so simple you don't need a guide at all to enjoy the full amazing experience of TuneLyrics. Small: At under 1 MB, TuneLyrics is much smaller than the size of your average song. Thats means more space for the music you love. Powerful: Being small and simple does not compromise TuneLyrics's features. Lyrics Search, album artwork search, auto-update all in one little wonderful app. Beautiful And Sleek: User interface is not sacrificed to give you this gorgeous companion to iTunes. Innovative: We are always looking for new ways to bring TuneLyrics to a higher level. That means a much better experience for you on the whole. Convenient: Being simple does not mean being convenient. That's why we made it so that everything you ever need is but a click away. Fast And Responsive: We are obsessed about speed. Every second you save just means more time for the music you love. Always Updating: That's right. We are always digging into TuneLyrics to find ways to make it much better and to let you enjoy the benefits as soon as we are done. Stable And Bug-Free: We do our best to catch every bugs we see and you can help us too -- just email us if you catch any bugs. We will do our best to fix them. Support-Ready: What's a good software without support? We are always ready to reply your queries and to accept feedbacks and suggestions. Just email us and we will get back to you ASAP. Free: And all these at the price of none! All we ask for are feedbacks and suggestions or you can always help spread the word around about TuneLyrics. So what are you waiting for? Click on the link to the right and grab the latest version of TuneLyrics. We <3 great music -- that's why we care. (Latest Version -- TuneLyrics 1.1.0, update from TuneLyrics or download HERE. So What's The Difference With TuneLyrics And LyricsMenu? If you are the type of person who prefer simplicity, go with TuneLyrics. If you prefer a bit more power at the price of simplicity, LyricsMenu is the way to go. But I would say, get both since they are both free. Let TuneLyrics retrieve the bulk of your lyrics and LyricsMenu to compliment it with the more difficult lyrics. Golly! TuneLyrics is wonderful! What can I do to help? Some ways you can do to help: Donate here to keep us going! Email us to thank us if you want or give us suggestions and ideas to improve TuneLyrics. Spread the word around through blogs or forums or any other ways you wish to let people know about TuneLyrics! Or just simply, keep using TuneLyrics and always trying out the latest version -- we will thank you a lot for your support! 1. When trying to download all the lyrics, I get an error or it freezes. A: Grab version 0.9.0, we have fixed it. 2. The lyrics only show 1-2 lines. If you have any questions, feel free to email us by clicking the feedback link below! !